Following a chance trial flying lesson in 1980, Diana found her true passion in life, and specifically the wonderful world of aerobatics. The following year - with a mere 60 hours of flying to her credit - she bravely embarked on a new career in competition aerobatics. Over the next five years, Diana progressed from the basic manoeuvres of Standard level, right through to Unlimited contests, where complex multi-figure manoeuvres and negative 'G' are the order of the day. She competed as often as time allowed in the UK and France, initially in the CAP 10B two-seat trainer, and then in the more capable single-seat CAP 21. In 1986, having held a Private Pilot's Licence for just six years, Diana revived the status of British women in the sphere of international aerobatics by being the first since 1970 to represent her country at a World Championship - when it was held in the UK at South Cerney. She went on to fly as a member of the British Team at both European and World contests for another ten years, four of which as team captain, competing additionally as an individual in the Spanish and Argentine Masters. Her campaign of competitive flying also extended to Eastern Europe and North America, and she gained numerous awards en-route. Solo navigation on the many long transit flights - in the days before GPS and with no aids other than a magnetic compass - she freely admits were often just as challenging as the contests themselves! Top-level competition flying, by its very nature, imposes extremely high 'G'-forces, with figures of +8 or -7 being by no means unusual. To cope with these demands, Diana upgraded her aircraft; first to an Extra 230 and then to the phenomenal Extra 260. The latter was specially built for her in 1991, and due to the power-to-weight ratio of its welded steel/carbon-fibre construction and Monty Barratt-tuned 6 cylinder engine, it remains a competitive aircraft to this day. In 1995, Diana became the first woman in history to claim the title of British Aerobatic Champion. 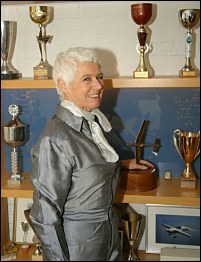 She has also won the British Freestyle Championship, Jean Lennox-Bird Trophy and Brabazon Cup. The European Pilots' Federation awarded her 'Woman of the Year', and she also holds a coveted Royal Aero Club Silver Medal. 1980 Gained PPL within 40 hours. 1981 First aerobatic competition - France, placed 1st lady (second solo flight in the CAP 10b). 1982 First aerobatic competition in England, CAP 10b. 1983/85 Campaigned in France, Holland and England in her own CAP 10b, G-BKUC, and brought home many trophies. 1985 Moved onto single seater CAP 21, G-BLZZ, gained a place in the British National Team. 1986 Competed in the '86 WAC - South Cerney, England. First British lady to fly in a World Championship since Frances McRae in 1970. CAP 21. 1987 British Team - European Championships - Speichersdorf, Germany. CAP 21. 1988 British Team - World Aerobatic Championships - Red Deer, Canada. Extra 230 G-DIAN. 1989 Sole British pilot to compete in European Championships - Bekescaba, Hungary. Extra 230. 1990 British Team - World Aerobatic Championships - Yverdon, Switzerland. Extra 230. Sole British pilot to compete in the Spanish Masters Aerobatic Championship - Ocana, Spain. Extra 230. 1991 Sole British pilot to compete in the Argentine Masters Aerobatic Championship. Pitts S1T/S2B. British Team - European Championships - Muret, France. Extra 260 G-EXTR. 1992 British Team - World Aerobatic Championships - Le Havre, France. Extra 260. 1993 British Team - European Championships - Grossetto, Italy. Extra 260. 1994 British Team - World Aerobatic Championships - Debrecen, Hungary. Extra 260. 1995 British Team - European Championships - Hradec Kralove, Czech Republic. Extra 260. OVERALL BRITISH AEROBATIC CHAMPION and the Neil Williams Trophy - Sywell. Extra 260. 1996 British Team - World Aerobatic Championships - Oklahoma, USA. Extra 300S. British Aerobatic Team Captain in 1991, 1992, 1993 and 1994. Chairman, British Aerobatic Association 1989 to 1993. Woman of the Year Award 1994 - Fédération des Pilotes Européennes. British Women Pilots Association Brabazon Cup 1986. 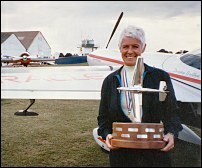 British Women Pilots Association Jean Lennox-Bird Trophy 1995. Royal Aero Club silver medal 1996. Pilot Magazine Freestyle Challenge Trophy - Biggin Hill 2000. National Free Style Champion - David Perrin Trophy. Best Display - RAF Valley, 2001. 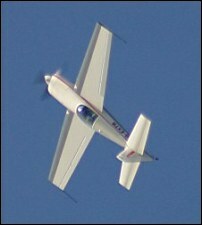 Flew displays at Farnborough 2002. 2003 to date: Displays at Little Gransden "Children in Need", Woodchurch "Wings & Things", Brize Norton and various French venues.